On March 10, 1949, two Israeli brigades - Negev and Golani - converged on the police station of Umm Rashrash on the Red Sea, now known as the resort city of Elat, and occupied it without firing a shot. This act completed the occupation of the Negev Desert, allocated to their government by the United Nations partition plan and was the last operation of Israel's War of Independence. However none of the soldiers had remembered to bring a flag with them, so a soldier by the name of Micha Peri hand drew one by pouring blue ink on a sheet. The result was apparently a kosher Israeli national flag with one exception - Peri appears to have smeared the Shield of David device, and filled it in entirely [as on this 1947 flag proposal]. This design was never used again. The flag is known as the Ink Flag. I found a good picture of it at the Elat website. The name of the police station was Umm Reshrash, and it was standing just where the city mall is today. 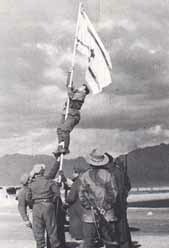 This scene of raising the Ink Flag at Eilat (...) reminds me of the Iwo Jima scene. The original poster mentioned the man who made the flag, but the man who is more famous is the man who hoisted the flag. His name is Avraham Adan, known as Bren (like the machine gun). He rose to be a general, his last commission in the army was Commander of the Armory, some 25-30 years ago. A monument in remembrance of the event was erected in 1996 and a photo of the monument side by side with a photo of the hoisting of the ink flag can be seen at the bottom of <www.eilat.muni.il>. Yhere was a piece at the daily "Yedi'oth Akhronot" about the ink flag of Elat. It seems that the flag was painted by Pu'ah Barkol (later Ar'el), the secretary of Nahum Sarig (Commanding officer of HaNegev Brigade), who was assisted by Leon Sherman, Brigade's Communications officer. Pu'ah told the reporter: "One day beforeour arrival to Um-Rashrash [today Elat], the brigade commander, Nahum, told me 'we must prepare a flag'. We were a Palmakh brigade and we didn't dealt too much with ceremonies, so we didn't had a flag. Nobody thought about keeping the flag. It has duplicated but the original is long gone...."